Mosaics in London did good! The sun is out, and it's time for a blog! First view of THE Oxo Tower! First of all, many thanks for all the support and good wishes I had with me in the.gallery@oxo show, in London. It was a challenging experience - some amazing handmade work being showcased, from textiles, to silverware, jewellery to..mosaics! - it was great to be among them. 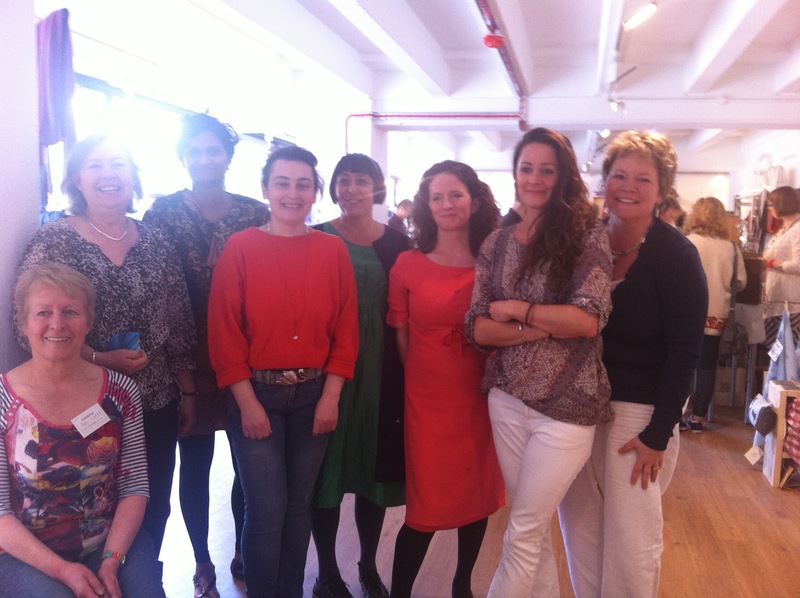 The gang of amazing designers down my end! I think I did what I set out to do, that is get my unusual unique mosaic art out there to see what people really thought of it! Scary but necessary! 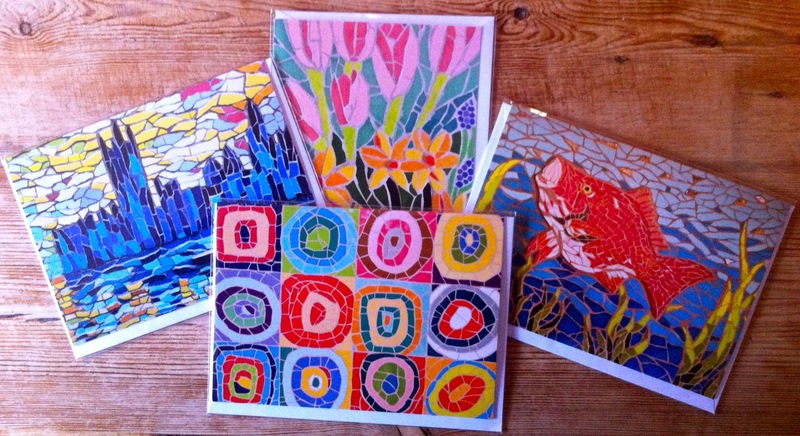 I found that people either hardly glanced at my 'stall', or absolutely loved my mosaics! So, when I had had enough people loving them, I didnt feel quite so upset at the glancers! I took every opportunity to give out my business cards - the other designer/makers laughed at me because I had a target number to give out each day - well, no good them sitting gathering dust in my studio! I sold ten pieces for cold hard cash, gathered contacts for future projects (I hope), gave out heaps of business cards, and sold over a hundred of my new greetings cards (see website!). I was delighted how they went down and already have some stockists for them. I'm realising what a great way it is to get my work out there as well! So, all good - shattering, exhilarating, exciting, scary and lots of other things besides. Great people around me to get to know in the quiet times, and brilliant to be on the Southbank! Promise, that's it - no more about the.gallery@oxo! 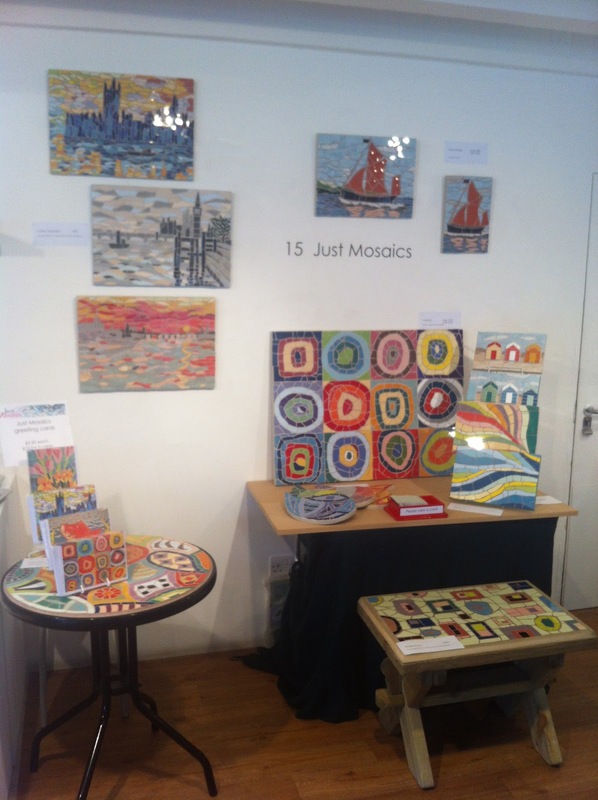 Orignal mosaic art goes to London! We leave tomorrow with car packed and hopes high - well, you've got to go for it, haven't you? I'm happy with what I have made, and my trusty iPad slideshow will be showing all that I can make, and have made, and would be happy to make again! Below are some of the examples of my exclusive work for the show..
Funky Union Jack - well, it is the Olympics and the Jubilee! The unknown is both exhilarating, challenging and scary - it's all about believing in yourself and what you do. This isnt always easy, is it? - but with a bit of discipline and determination, CAN be done - seize the day! 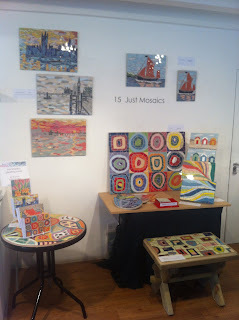 I will be tweeting regularly from the show about all the amazing work there - @justmosaics - and will blog on my return, with lots of stories to tell, I hope! !